FARC leaders Ivan Marquez and Oscar Montero denounced in an open letter to the Colombian Congress the government has failed to fulfill the peace agreement. Ivan Marquez and Oscar Montero, members of the Common Alternative Revolutionary Force (FARC) denounced in an open letter to Colombia’s Congress that “the fundamental pillar of the Peace Agreement of Havana has been betrayed” but insisted they continue to believe Colombia’s future can only be peace. The two former FARC guerrilla fighters, whose whereabouts are unknown, denounced in the letter “three acts of folly” that drove the peace process to the abyss. The three acts they refer to are legal uncertainty, modifications to the signed agreement and failure to fulfill key aspects. Marquez, who was elected senator, refused to take his seat in the Senate citing the “judicial montage” against Jesu Santrich, key peace negotiator for the FARC. In the letter to Congress Marquez and Montero accuse the Attorney General, the United States ambassador, and the U.S. Drug Enforcement Administration (DEA) of sabotaging peace by imprisoning Santrich, a former FARC commander taken into custody on April 9 after the DEA requested his extradition on charges of drug trafficking. “This delusional action conceived to sabotage peace banished the weak trust that former combatants had,” they write. Last week, Colombian prosecutor Nestor Martinez admitted before the Special Jurisdiction for Peace (JEP) that he doesn’t have proof of Santrich’s alleged participation in the crime of drug trafficking, but expects the U.S. justice system would provide evidence soon. “We are before a blatant abuse of power, mixed with an unacceptable rendition of our judicial sovereignty to a foreign power,” the letter states. According to the two FARC leaders, the JEP is not the one agreed upon in Havana, but the one prosecutor Nestor Martinez and the “enemies of peace” wanted. The JEP “is no longer for all who were involved in the conflict; they removed the third parties from its jurisdiction, they surrounded truth with darkness, which is the only thing that can close and heal the wounds created by the conflict and create a new environment for coexistence,” they warned. in August, the government of President Duque presented a bill to Congress ordering that "under no circumstances" should investigative bodies such as the JEP or the Truth Commission be allowed access to military intelligence regarding national security. In June, Congress approved changes to the JEP by ordering the creation of an exclusive tribunal for police and military agents, which risks delaying judicial processes against state security officials. “The former Congress sunk the political reform and special territorial districts for peace. Amnesty wasn’t fully implemented, we still have guerrilla fighters in prison. Five years after reaching the first partial agreement there are no land deeds, no three million hectare fund of land for those who don’t have it, nothing to dignify life in rural Colombia,” FARC leaders argue. Human rights groups have reported that most murders against social leaders in Colombia have been perpetrated by paramilitary groups. Since the peace agreement was signed in 2016 over 400 social leaders and around 80 demobilized FARC guerrillas and their relatives have been murdered. “Today former combatants are being murdered one by one in the midst of indifference by the authorities, the same happens with social leaders,” Marquez and Montero lamented. The ICRC asked the Colombian government to implement more effective measures to prevent further disappearances. The International Committee of the Red Cross (ICRC) has urged the new Colombian government to search for the over 83,000 people who disappeared in the country, in commemoration of the International Day of the Disappeared, which takes place every Aug. 30. The head of the ICRC delegation in Colombia, Christoph Harnisch, has highlighted that "The new Government headed by Ivan Duque) must make an effort to prioritize the search for missing persons and ensure that (everything is done to ensure that the families have a response." The Unit for the Search of Disappeared People (UBPD) was created as part of the peace accords between the Colombian Government and the now political party Revolutionary Alternative Forces of the Commons (FARC) which was signed in 2016. Luz Marina Monzon, director of the UBPD, asserted that political will is needed because families are yet to receive any response. "The creation of the UBPD and the ratification by the Constitutional Court of its extrajudicial and humanitarian character are in themselves positive steps, however, we expected the advances to be much faster," Harnisch said, while addressing the over 83,000 forced disappearance cases, that took place between 1958 and 2017, during the armed conflict in Colombia. Harnisch also highlighted the importance of having human and financial resources in order to work effectively, in the territories and with the families, in the search process. Colombia's newly installed right-wing government of President Ivan Duque has filed draft legislation ordering that "under no circumstances" should investigative bodies such as the Special Jurisdiction for Peace or the Truth Commission be allowed access to military intelligence. The FARC urge "the progressive and democratic peoples and governments of Latin America, the Caribbean and the world, not to allow more interference on sovereign Venezuela." The Revolutionary Alternative Forces of the Commons (FARC) party stated, in a release, Thursday that "Colombia cannot support a foreign intervention against Venezuela." In the statement, the political party rejected the Colombian Government favoring a military intervention against Venezuela, led by the Venezuelan far-right and its foreign allies. The release highlighted that "the political, diplomatic, economic, social and military siege aims to destabilize and overthrow the legitimate government of President Nicolas Maduro and to reverse the Bolivarian Revolution, resorting to whatever means that are within its reach; it is a real element that the Venezuelan national extreme right, its allies abroad and the empire itself cannot deny." The FARC party also said that the repercussions of a military intervention would be catastrophic for Latin America in general and for Colombia in particular, "with the burden of death and desolation that it would imply." 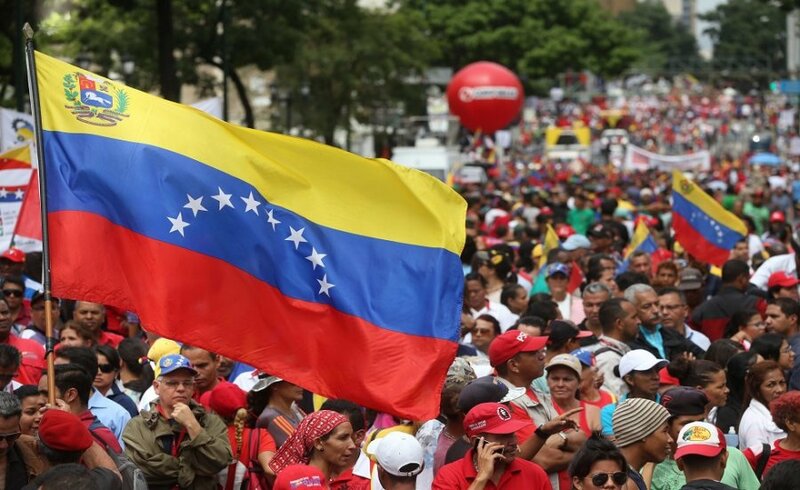 The group is urging for the unfriendly and aggressive actions against Venezuela to stop, and calling for "the progressive and democratic peoples and governments of Latin America, the Caribbean and the world, not to allow more interference on sovereign Venezuela." FARC call on the Latin American people to reject foreign intervention in the South American continent and highlighting that the "continent is a zone of peace and we must not allow ourselves to be deprived of that right." Recent developments, including the killings of former FARC fighters and arrest of its future representative Jesus Santrich, have put the process at stake. The Cuban and Norwegian governments, which sponsored the talks and the subsequent peace agreement between the Colombian government and the former insurgent group FARC, expressed their concerns about the current state of the implementation of the peace process in the country amid the persecution and killing of former members of the former guerrilla group as well as the recent arrest of congressmen-elect Jesus Santrich. The Alternative Revolutionary Forces of the Common, the new political face of the FARC, back tracked on their presidential campaign as their leader Rodrigo Londoño “Timochenko” suffered from health issues and the party decided the government wasn't providing the party members with the ideal security conditions. The situation escalated when Jesus Santrich, a former FARC commander, was arrested on drug trafficking charges by DEA's order, who accused him of taking part in a business network intending to export 10 tons of cocaine into the United States, and may now face extradition. "With the capture of our comrade Jesus Santrich, the peace process is at its most critical point and is threatened to be a true failure," said Ivan Marquez, future representative and number two of the FARC, said at a press conference in Bogota last week. He also demanded Colombian President Juan Manuel Santos "keep his word" regarding the peace process. Interpol's red alert accuse Santrich of participating in the drug trafficking network between June 2017 and April 2018. His defense filed an Habeas Corpus appeal but it was rejected by Bogota's Superior Tribunal. Also, the activities of groups claiming to be FARC dissidents who oppose the peace agreement and have refused to demobilize, are being used to discredit the peace agreement despite FARC leadership distancing itself from them and rejecting their actions. One of those groups, the Oliver Sinisterra Front led by Guacho, recently kidnapped and murdered three Ecuadorean journalists reporting on the violence situation on the border between both countries. Added to that, some in the Colombian government claim that the former insurgent group wasn't honest about their assets and accused it of running a money laundering chain of stores, which sparked riots and looting in several cities of Colombia. FARC leadership flatly reject such accusations and said they have made all their assets available and have welcomed any government audits. They also recommended speeding up the actions aimed at guaranteeing the full reintegration and reincorporation of FARC's former fighters into civil society and reiterated their compromise to reach a stable and lasting peace in Colombia. Gloria Ospina, director of the Colombia in Peace Fund, was dismissed from office on April 9 after being accused of irregularities in managing the economic resources provided by the international community for the peace process. The peace process has been heavily politicized and is one of the main discussion points for all candidates in the May 27 presidential elections. Most of them support the continuance of the process, including leftist Gustavo Petro, but the right-wing protegee of Alvaro Uribe, Ivan Duque, has said the agreement needs serious restructuring. Londoño, known as Timochenko, was nominated as the political group's 2018 presidential candidate by a majority vote. The Revolutionary Alternative Force of the Commons has announced Rodrigo Londoño, popularly known as Timochenko and former leader of the guerrilla group, as their candidate in the 2018 Colombian presidential election as the group awaits the legalization of its newly established political party by Colombia's National Electoral Council, according to Caracol Radio. Until this process is complete, the FARC will be unable to advance with the formal registration of their presidential candidate and congress people. The decision to nominate Timochenko was made in a majority vote by FARC members, despite their belief that his chances of reaching the presidential palace are minimal. However, they expressed their desire to have a candidate run in next year's presidential election, forming political coalitions in the process that would eventually run a candidate with greater chances of winning in future campaigns. FARC members noted that this would entail a transitional government aimed at consolidating peace throughout the country. FARC representatives also stated that in the coming days they will officially announce Pablo Catatumbo, Ivan Marquez and other members who will run for congressional seats, according to Caracol Radio. With Timochenko at its head, the FARC faces many obstacles as it attempts to transform from a guerrilla group into a political party, with members pointing to the lack of will shown by the administration of Juan Manuel Santos to carry out true peace as social leaders and FARC members continue to be targeted by paramilitary forces and the Colombian military. However, the former guerrilla leader said he would uphold his commitment to peace and signaled he would work closely with the two commissions set up in order to re-structure the party. “Just like all of you, what motivates me is that the (peace) process moves forward,” he reiterated. The peace process in Colombia also created a unique opportunity for students to learn more from the Cuban health system, which is praised worldwide. Some 200 young Colombians — mostly former FARC members and campesinos — arrived in Cuba to begin their studies at the Latin American School of Medicine as part of the offer made by Cuba after the peace accord between the Colombian government and the Revolutionary Armed Forces of Colombia. The Cuban government is set to grant 1,000 annual scholarships in the next five years for students from Colombia, which will include aspiring doctors that had to postpone their training due to the armed conflict of more than 50 years in their country. The medical students arrived at Jose Martí International Airport where they were received by the dean of ELAM Antonio Lopez. Authorities say this is a contribution of the Cuban government to the implementation process of the peace deal which was negotiated and reached in Havana. "The opportunity to be in Cuba is great because the health system model developed here is to serve the human being, always trying to prevent diseases and that seems fantastic," Duerney Perez, a young student told Prensa Latina. "I come from the department of Caqueta, very affected by the violence that the war created," Perez said. The Cuban Ministry of Foreign Affairs supported the agreement reached on Monday between the Colombian government and the National Liberation Army (ELN), as a result of talks held in recent months. In a statement about the talks, in which Cuba participated as Guarantor, the Ministry of Foreign Affairs stressed last night that this step will allow to reach and start the public table talks between the two sides in Quito, Ecuador, on October 27, 2016. This represents a new step forward in the efforts to achieve peace in Colombia. The two sides also reaffirmed that Cuba is one of the countries that will act as Guarantor and Headquarters in that negotiation table. In this regard, the Ministry of Foreign Affairs reiterated Cuba's firm commitment to the end of the armed conflict and the construction of a stable and lasting peace in Colombia. In this context, it will continue contributing as much as possible, at the request of the two sides, to the achievement of a final agreement between the Colombian government and the National Liberation Army. In a landmark moment in Colombia's history, the peace delegations of the government of President Juan Manuel Santos and the country's Revolutionary Armed Forces of Colombia gathered Wednesday evening to announce the end of negotiations and a final peace accord in Havana, Cuba, after nearly four years of negotiations between the two sides of the conflict. The parties have spent the last several days reviewing the final text, which will be put to a popular vote on October 2. "Now the battle of ideas can start," the FARC-EP's representative Ivan Marquez said, adding that the final deal marks a new chapter in Colombia's history. "The peace deal is a point of departure—not of closure—toward the social transformations demanded by the masses." Government representative Humberto de la Calle said, "I am certain now that this is the best agreement possible. But the Colombians will judge." President Santos insisted that the text of the final agreement was “definitive,” and could not be modified. “From the beginning, one principle ruled the negotiations: nothing is agreed until everything is agreed. Today, at last we can say that everything has been agreed,” he added. The final deal will mark the end of 52 years of armed internal conflict between government forces and the FARC-EP, founded in 1964 based on Marxist ideals of agrarian reform, rights for rural communities and social justice. The conflict is the longest-running civil war in Latin America. "Peace," Cuban peace guarantor Rodolfo Benitez noted, "is guaranteed as a right of Colombian citizens in their nation's constitution, something that has eluded the South American nation for the last five decades. "The sum of the partial agreements reached so far are contributing to compliance with the rights and duties guaranteed by the Constitution," said Benitez, "including the fundamental rights of campesinos, Afro-Colombians and Indigenous communities. "The final deal," he continued, "means to address the root causes of the conflict: land, property, exclusion of campesinos, affecting especially women and children." Dag Nylander, Norway's peace guarantor added, "We don't want one more victim in Colombia. A new chapter of Colombia's history is opened," with the final deal allowing for "more social inclusion, especially of those who have been excluded and historically more affected by the conflict." The final agreement announced Wednesday calls for meaningful agrarian reform to address inequality in poor, rural areas. It calls for new political forces to address the issues that initially led the FARC-EP to take up arms, and also guarantees the safety of the rebels after they put down those arms to participate in politics. The agreement calls for protection of human rights activists and labor organizers who have been targeted by right-wing paramilitaries; alternatives to illicit drug production; reparations for victims of violence on all sides; and a commission made up of the Colombian state, the FARC-EP, alongside the United Nations to monitor the accord's implementation. The announcement brought an end to nearly four years of negotiations in Havana, launched in 2012. FARC-EP leaders will now take the agreement back to its camps to share the information with its ranks, which could be the last such FARC-EP conference with armed rebels before the group transitions into a non-military political movement in accordance with the peace deal. Negotiators have already reached and announced landmark partial agreements related to five central matters: political participation, end of the conflict, transitional justice, agrarian reform, and crop substitution for illicit coca crops. The announcement of a bilateral ceasefire deal on June 23 was widely celebrated by Colombians. The vote on the final peace agreement is expected to take place on Oct. 2 and electoral authorities will determine whether public funds will finance the campaigns in favor and against the peace deal. In order to pass, a majority of 4.5 million Colombian voters—a 13 percent participation threshold—need to vote “Yes” in the plebiscite. Far-right former president and current Senator Alvaro Uribe, whose presidency saw record levels of paramilitary activity, human rights violations and displacements, has been pushing for a "No" vote. According to a recent Gallup poll, of the half of the population that had made up its mind on how they would vote, 67.5 percent were ready to vote in favor of ratifying the final peace deal, while 32.5 percent said they would vote against it. The FARC-EP has said that the putting down of arms is the beginning of peace and a process of reconciliation to unite “two Colombias,” of which it represents the marginalized groups that have suffered most under the armed conflict. Colombia's over five-decade civil war has killed over 220,000 victims and uprooted some 6.3 million people, making it home to the second largest population of internally displaced peoples in the world after Syria.